What is franchise lead generation? The simplest example would be McDonald's (A Franchisor) wants to open up new locations. Therefore, they need to find someone (Franchisee) to pay for the ability to be the new owner. The process of finding potential franchisees and turning them into owners is known as franchise lead generation. Here at FranchiseHelp, we specialize in using the internet to accomplish this goal. However, franchise lead generation comes in all shapes and sizes with the internet being one of many tools that a franchisor has at its disposal. This primer is designed to introduce franchise lead generation as a whole, without preferring one method over another. 1 –Acquiring Visitors -- Grabbing the attention of someone for the purpose of informing them of the opportunity to learn about franchising: The easiest misnomer here is to think that acquiring visitors is simply a synonym for advertising. This is only partly true as potential franchisees experience franchise brands in all sorts of different ways (especially as customers! )The process of acquiring visitors never stops. It’s true that the ultimate last step will likely be an advertisement (or a Google search), but it’s equally important what happens before that. 2 – Turning Visitors Into Leads -- Soliciting contact information for the purposes of follow-up: In the 21st century, getting someone to give you their contact information keeps getting tougher and tougher. But step two is all about completing that goal. A franchise has no ability to follow-up with someone unless they have a phone number or email address. (Or mailing address, although this is becoming less and less popular.) Upon receipt of the contact information, it’s generally understood that intent to open a franchise is at least moderately high. 3- Turning Leads Into Candidates -- Beginning the follow-up process and answering relevant questions about franchising or a specific franchise: After receiving a set of contact information, the contact plan is important. Without a doubt, you don’t get a second chance to make a first impression. Call? Email? Text? And then what’s the follow up plan? A good candidate will have A LOT of questions about both franchising and the specific franchise, so the ability to field these questions well can make or break the deal. 4 – Turning Candidates into Franchisees -- Closing the deal by fully immersing a person in a specific brand and finding a mutual interest in that person becoming part of the franchise ownership team: The close! No matter how confident you may be in someone’s likelihood to open a franchise, it’s not a done deal until the checks clear. The last step is about making a potential franchisee feel comfortable with their ultimate decision. A franchisor sets up a booth at a franchise expo in Houston. The franchisor trusts the organizer of the expo to generate foot traffic for the expo. When the expo starts, visitors come by the booth (1). After being greeted by a sales representative from that franchise, eventually the conversation turns to the nuts and bolts of opening up a location. Having asked a few qualifying questions, the sales rep asks the visitor for their contact info, so they can follow up (2). After the show ends, the sales rep returns to their desk and calls the visitor (3). After speaking with them a number of times, getting them financially qualified, and having them tour one of the current locations, the visitor agrees to open a franchise (4). A franchise consultant decides to host an event at a local gathering spot focused on the frequently asked questions of potential franchisees. In order to attract people, the consultant takes out an advertisement in their local newspaper (1). At the event, the consultant hires someone to check people in and take down their contact information and getting them a name tag (2). After giving a brief presentation and answering a number of questions, one of the visitors approaches the consultant afterwards and asks if he/she can help them find a franchise. The consultant agrees and follows up with the visitor the next day (3). The consultant presents the potential franchisee with a number of different options before settling on one or two that fit best. The consultant then introduces the person to the franchises and let the franchises battle it out before one is finally selected (4). Someone has a very crappy meeting with their boss. The boss lets the person know that they’re probably not going to be eligible for a promotion this year. Returning to her desk, the employee Googles “Be my own boss” and is met by an advertisement touting franchising as the easiest way for someone to become an entrepreneur. After clicking the ad (1), the employee is taken through aquiz gathering relevant pieces of information leading toward which franchises are the most appropriate for her to open. After being presented with a number of options, the woman selects three different franchises and enters her contact information (2). Each franchise, having been sent the woman’s contact information, follows up with an automated email attempting to set up time to speak. Since entering her info, she's decided that only one of the franchises is right for her and she responds to that franchise setting up a time to speak (3). After moving through the familiar sales process, she ultimately decides to buy a franchise (4). Each path follows a similar path that is described above. In all three instances, the franchisor needed the help of another entity to help accomplish its goals. Ultimately, the job of the franchisor is to determine the efficacy and the efficiency of each different types of lead generation. Efficacy – Which types of lead generation actually leads to new franchisees. It’s possible that certain types of franchise lead generation produce very few or perhaps zero franchisees. Efficiency – Given the fact that franchise lead generation costs both financial and human resources, which types of franchise lead generation produce the lowest cost per franchise as defined by: total resources dedicated to one type of franchise lead generation (we suggest dollars as the metric here) divided by the number of franchisees that method produces. A particularly analytical franchisor may look at the two descriptions above and refute that efficiency is way more important than efficacy. While I can’t wholeheartedly disagree, here’s why that isn’t always right:There may be a particularly efficient method of lead generation that simply doesn’t scale. For example, you may find that people who attend one of your franchise’s webinars are very likely to open a franchise. However, if you can’t attract that many people to attend, then it’s likely not going to be a scalable source. The challenge facing franchisors boils down to how to allocate a set of limited resources across a number of different lead generation strategies to meet their goals of new locations. You get a real variable cost budget of $300,000. So suddenly now the variable cost per new franchisee becomes $30,000. With the increasing importance of SMS for franchise lead generation and development, we've begun advising franchisors -- whether they work with FranchiseHelp or not -- on how best to incorporate texting into their franchise lead generation and sales process. Schedule time to speak with our experts, free, about the right way to use text messaging to sell more franchises. Or if you're looking for simple-to-use texting technology built specifically for franchise development teams, you'll want to check out FranFunnel now. 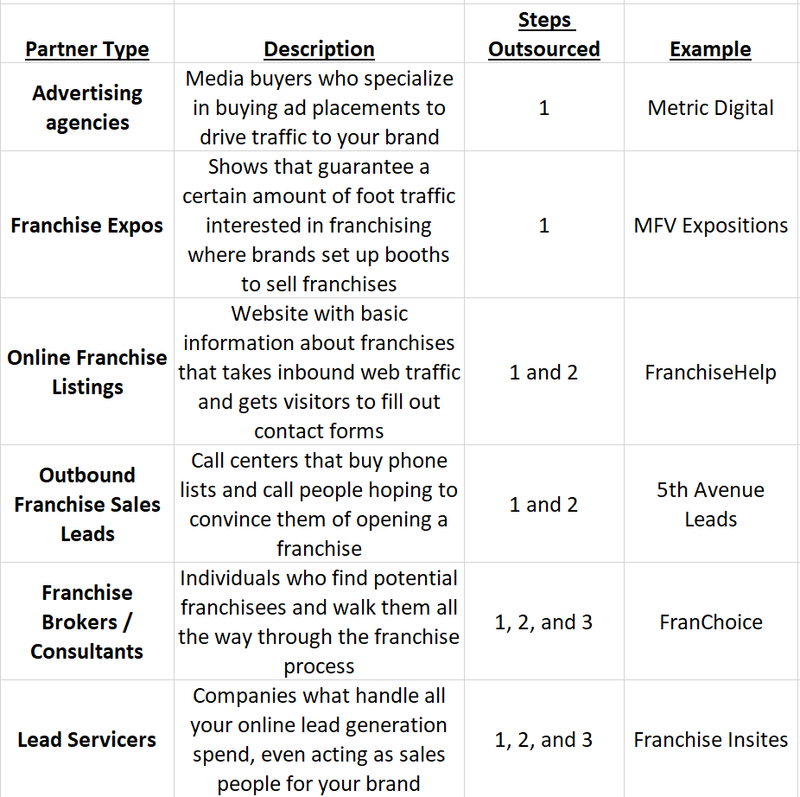 So, thinking about a franchise’s imaginary $30,000 per franchisee budget, they have a number of different options for helping them generate leads. As expected, the costs of each different partner are correlated to the amount of work the partner needs to do and approximately how well they assist a franchise’s lead generation process. Finally, it’s important to remember that this is not a static world. Whatever worked as a strategy yesterday may or may not work today and who knows about tomorrow. A savvy franchise will continually test new ideas, hoping to continually bring the total number of new franchisees up and the total cost per franchisee down. Ultimately, the success of a franchise is directly tied to the success of the development function of the business, so getting franchise lead generation right is vital. The easiest thing to do is to check out the rest of FranchiseHelp’s Lead Generation Resource Center. FranchiseHelp has put together a full suite of posts that explain everything you could possibly want to know about effective franchise lead generation. And if you don’t see something that you’d like some help explaining, reach out (see below) and we’ll have an answer for you ASAP. If you’re interested in speaking to our team directly about franchise lead generation for your concept or brand, reach out to us here and we’ll share with you the lessons we've gained (metrics to monitor, best practices to follow, and critical pitfalls to avoid) from the tens of thousands of leads we generate for our franchise partners every month. Eli Robinson is the COO of Metric Collective, the parent company of FranchiseHelp. He frequently contributes his thoughts on franchise development technology, marketing, and best practices to FranchiseHelp's Lead Generation Resource Center (FranchiseHelp generates franchisee leads for franchisors) and FranFunnel's Bulletin (FranFunnel is the leading text messaging solution designed specifically for franchise development).